The 4th Street Transit Station is located on the corner of 4th Street, Lake Street, Evans and Plaza Streets. 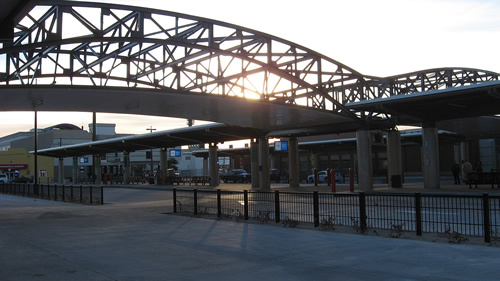 It replaced the CitiCenter transfer station located on Center Street and 4th Street, just west of the National Bowling Stadium. The project was funded by a federal transportation package secured by Harry Reid and John Ensign, as well as from the sale/reimbursement from the old CitiCenter property. Designed by Parsons Brinckerhoff Inc., and constructed by West Coast Contractors on 2.5 acres. It created 457 construction jobs and included $4 million in federal American Recovery and Reinvestment Act stimulus money. Construction began in April 2009. With 23 bus bays, it will serve the community for decades to come.